A revised bagel review—4 Blogfingers for the Hot Bagel Bakery in Oakhurst. 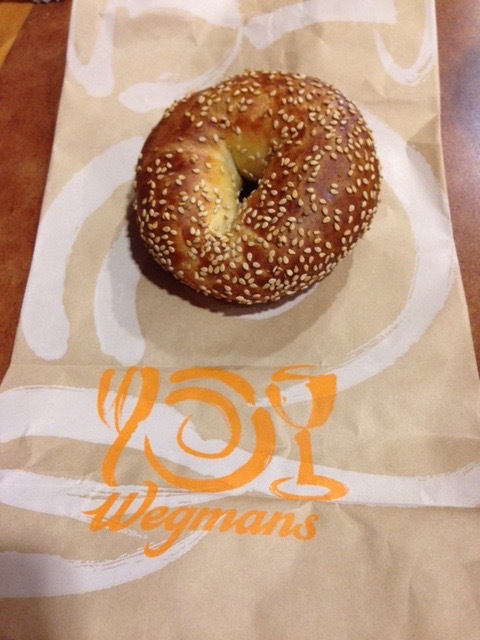 One year ago I wrote a piece extolling the bagel artistry at Wegmans in Ocean. I go there most mornings where they have a custom bagel ready for me. In the comments, some Grovers chimed in with their favorite bagel bakery in Monmouth County—the Hot Bagel Bakery in Oakhurst. I did review the HBB in 2014 (see comments below), but I didn’t think it was as good as Wegmans. There are three comments below from that article on September 4, 2014. In the year since this article was written, I have come to know the Hot Bagel Bakery in Oakhurst (65-67 Monmouth Road) a lot better. I now believe that I under-appreciated that bagel place. You really should visit it one morning just to see the excitement as the hand rolled bagels are made in front of you. It brings back the sense of another era—-the time when kosher deli’s were all over New York City providing the equivalent of soul food in Harlem. I also discovered their onion bagel, toasted twice and then with a shmeer of cream cheese. The heat of the toasting provides additional crunch, taste, and aroma. The cream cheese begins to melt immediately, so you have to be careful to eat it without dripping cheese all over yourself. They hand over your bagel in a brown bag, and inside the bag are napkins. I now give it 4 Blogfingers—a revised score. And, is it better than Wegmans? Well, let’s just say that it’s different. THE PARROTHEAD ALL STARS with CLINT BLACK and FRIENDS performing this Jimmy Buffett song. These country all stars may have somethin’ cookin’, but I bet none of them could tell a good bagel if they actually saw one. The best bagels are at the bagel store in Oakhurst on Monmouth Road across from Rook, the best coffee place ever. Mindy of Ocean Grove is referring to the Hot Bagel Bakery in a strip mall in Oakhurst, near Deal Road. The address is 65-67 Monmouth Road. This bakery has been in business since 1979 and they are strictly Kosher. 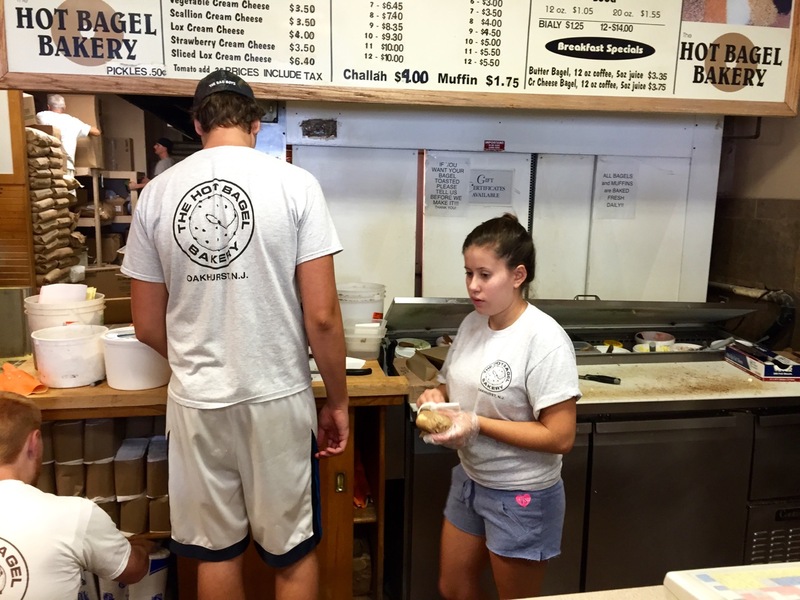 They also hand roll their bagels, so it is interesting to watch from the counter. Their bagels are quite tasty, but they are too pale and too blown up. The crust is only mildly crunchy. I ordered a sesame there which was so rotund that there was no hole in the middle. Any bagel without a hole should be penalized two Blogfingers on that alone. You need a hole to help it breathe and to give you a place to put your finger. I also asked for butter, but the schmeer was barely visible. You could probably enjoy it more by pulling out the doughy air blown interior and then toasting it. Their coffee was just average, and there was no place to sit. We didn’t get to try the coffee place across the street. And finally, let it be known that Caren C. of Ocean Grove also likes this place best. It really is a matter of taste and, for comparison, what your gold standard is. My opinion: Wegmans is better and closer. You can also get there via Rt. 35 and then right onto Deal Road, and then left on Monmouth Rd. They are on the right in a strip mall. Their parking lot is hazardous, so don’t chew and drive. And the exit onto Monmouth Road is annoying, especially if you turn left as most Grovers will do. So any business that has survived nearly 40 years deserves the benefit of the doubt. If you are a bagel maven, go there yourself and try it. They also sell challah breads. Now that Freedman’s is gone, this might be the go-to place on Fridays. We give them 3 Blogfingers. Anybody want to join me for the Bradley Beach review? Bagel Station in Red Bank across from – guess – the train station. The Hot Bagel Bakery has great bagels. Another good place is Cravings in Allenhurst. Interestingly, they get their bagels from the Hot Bagel Bakery, they have seating, and it’s closer than Wegman’s and the Hot Bagel place. I used to go there almost every morning on my way to the train when I was working in NY, and also when I worked in Eatontown. Another perk- the staff is very friendly. 🙂 I enjoy the bagels from Bagel Talk in West Grove Square, and the bagels, sandwiches, and peaceful atmosphere at Belmar Bagels in Belmar Plaza. Bagel Station in Red Bank is excellent as well. We sure have a lot of good bagels in the area! I don’t care for International Bagels, and I’ve never had the ones at Wegman’s. The best bagels in the county are at Bagelmasters in Shrewsbury on Rt 35. Joe: New York City has the best bagels in the world, but even New Yorkers disagree vehemently as to who makes the ultimate bagel. (see link above) There are fundamental differences such as toast or no toast, slender or super-sized, crunchy or soft, etc. There is a traditional way to make bagels based upon the early Eastern European Jews from Poland who brought their craft to the Lower East Side around the time when Ocean Grove was founded, but I bet Rev. Stokes never tasted a bagel. So it’s not surprising that Grovers disagree about which are best in Monmouth County. If you live in South Dakota, you might love the white bread bagels, the size of your head, but, as Bob Dylan of Minnesota says, “The times are a-changin'” Nevertheless, I bet Bob takes his with a cream cheese “shmear”—no butter and no toasting allowed. He spent a lot of time in Greenwich Village. Love your foodie reviews. Gives us an opportunity to try some of the recommended places. You are right in that some larger bagels are more like bread and lack a crunchy crust. Suggest a review on the best corned beef in the area. Much of what passes as corned beef is taken from the deli case, warmed and slapped on rye. I am talking about properly boiled corned beef. Clancy’s has excellent melt in your mouth corned beef Rubins. What are some of the favorites in the area?